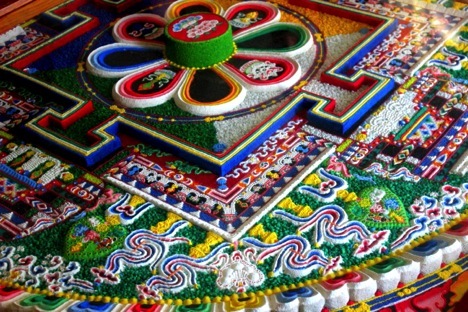 Emory offers so many opportunities to engage with Tibetan culture-whether it's taking a meditation class or going abroad, watching monks create a sand mandala during Tibet Week, or just chatting with Tibetan students on campus. There's really something for everyone. Emory University offers a robust array of academic and cultural programming highlighting many different aspects of the Tibetan tradition. In addition to having one of the nation’s premier programs in Tibetan Studies, students also have access to a unique, summer study-abroad program in Tibetan Mind-Body Sciences. Students in the study abroad programs have the opportunity to meet and interact with Emory Presidential Distinguished Professor, His Holiness the Dalai Lama. 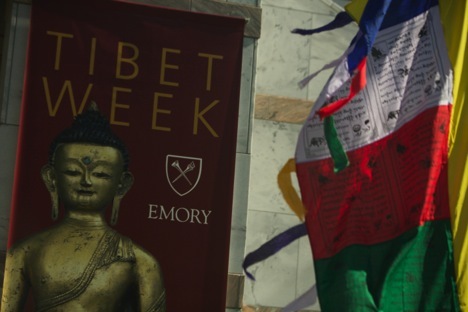 The Emory-Tibet Partnership hosts an annual Tibet Week at Emory University, typically held each year in March. Tibet Week includes guest speakers, multi-disciplinary presentations, opportunities to learn meditation, and other events celebrating Tibetan culture and the programs of the Emory-Tibet Partnership. We hope you can join us for Tibet Week 2017 beginning with opening ceremonies at noon on Monday, March 20. Click on the Tibet Week link above for detailed information! “The Emory-Tibet Symposium: Bridging Buddhism and Science for Mutual Enrichment” is truly a unique conference in that it represents the first time that Buddhist scholars and scientists will engage topics of shared interest as peers investigating similar questions from different perspectives. Invited speakers representing both leading scientists and Buddhist scholars at the forefront of this convergence, will make presentations on fundamental questions such as "What is life and what are its origins?" and "What is the nature of consciousness?" Presenters and panelists will discuss their viewpoints with His Holiness the Dalai Lama in sessions moderated by ETSI faculty leaders. The first annual Emory-Tibet Symposium was held at Drepung Monastic University in south India December 18-20, 2016. In addition to Tibet Week, the Emory Tibet Partnership hosts many events throughout the year to showcase Tibetan culture on campus. These events have included visits by Tibetan artists and musicians, visiting scholars, and leaders from the Tibetan diaspora.